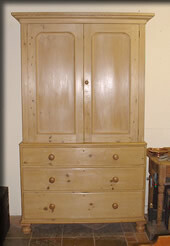 Lovely antique pine wardrobe compactum of the type that comes apart into several pieces for moving and getting upstairs. Continental, early part of last century. This wardobe has hanging space behind the left and right-hand doors and shelves in the middle section. Two curved-front drawers. Panelled sides. Approx 77 and 3/4"H x 65 and 1/2"W x approx 24 and 1/2"D all including overhanging trim. 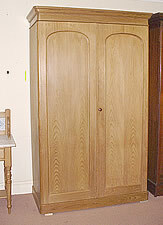 It is unusual to find small wardrobes that also come apart to move and get up stairs. 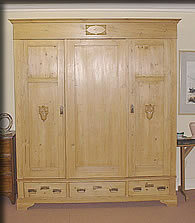 This antique pine wardrobe comes apart into almost "flatpack". Continental, early last century. Approx 43"W x just under 74"H x 22"D all including overhanging cornice. All hanging inside with one drawer under. Pretty decorative detail. A little paler than appears here - more photos soon. Internal depth is approx 18". Photo doesn't do justice to this super Victorian/Edwardian two-door wardrobe with original fittings of rail, slides and drawers. A rail could be put in the left-hand side instead of the slides if you would prefer. 82 and 1/2"H x 23 and 1/4"D x just under 50"W - all including overhanging cornice. Internal depth of just under 19 and 1/2". Dismantles into four pieces for moving. Classic English example in excellent condition. 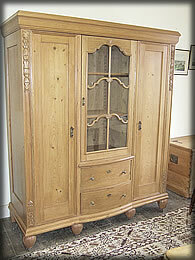 Antique pine wardrobe - continental, Edwardian era. Dismantles into almost "flatpack" for moving or getting upstairs. If you want all hanging the shelves come out easily and we can put a rail in for you. 74 and 1/2"W x 84"H x 25 and 1/2"D.
APOLOGIES IF A LOT OF OUR STOCK SEEMS SOLD OR RESERVED - WE HAVE BEEN FRANTICALLY BUSY BUT ARE WORKING HARD TO GET MORE RESTORED AND THEN FIND TIME TO UPLOAD ONTO THE WEBSITE FOR THOSE OF YOU UNABLE TO VISIT US HERE! 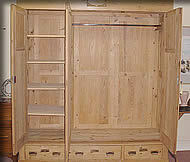 More wardrobes available in the shop/storage. Our pine furniture has a wax finish (unless otherwise stated). The camera flash bounces off the buffed wax which can make items on our website look a bit glossy or even varnished, depending on your monitor settings. If in doubt please ask. 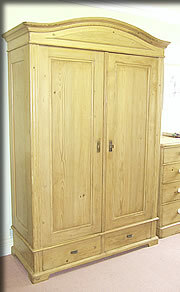 Antique pine wardrobe that comes apart into almost "flatpack" for getting up staircases. Continental early part of last century / Edwardian era. Approx 53"W x 80 and 3/4"H x 23 and 1/4"D(all including overhanging cornice at top). Better quality than average and in very nice condition for its age with reeded edges and panelled sides. All Hanging space inside with two drawers below the doors. SORRY - THERE ARE MORE HERE IN THE SHOWROOM - WE HAVEN'T HAD A CHANCE TO PHOTOGRAPH AND UPLOAD YET ! 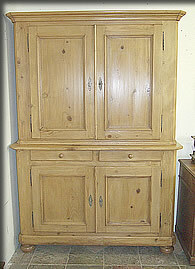 Antique pine wardrobe of the type that almost "flatpacks" for moving. Continental, early part of last century. This wardobe has hanging space behind the left and right-hand doors and shelves behind the middle door - but you can have another rail in the middle if you prefer all hanging space. Three drawers. Panelled sides. Approx 76 and 1/2" x 66"W x 24"D all including any overhanging trim. 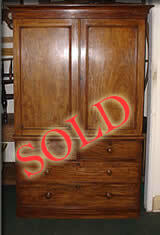 Handsome wardrobe in very good condition for its age. 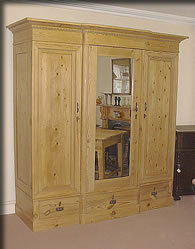 Antique pine wardrobe. Continental, early last century. Approx 42"W x 75 and 1/2"H x 23 and 3/4"D all including overhanging cornice. All hanging space with large "well" inside as there is no drawer as such. Lots of internal depth - approx 20". Handsome clean example with a bit of detail including dentil trim within cornice. Please be aware that this wardrobe does not come apart in any way for ease of moving so please check your stairs ! 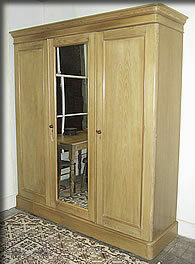 Victorian / Edwardian era (European) Housekeeper's cupboard in very nice original condition. Top half lifts off the base for moving. Shelved inside. 80 and 1/2"H x 56"W (including overhanging cornice at top) x 18 and 1/2"D (this is where the top of the bottom half projects forward). 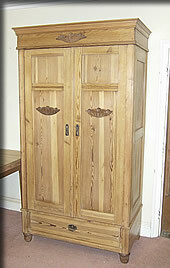 A handsome, genuine and sturdy cupboard. 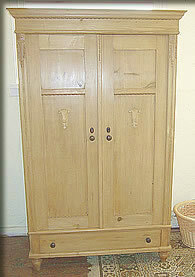 Late Victorian / Edwardian pine wardrobe. 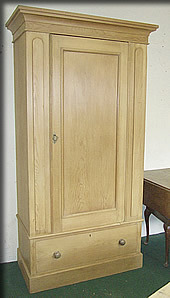 It is unusual for English wardrobes of this small size to have the internal depth for hangers to hang the "modern way" - this one does as it has over 18" internal depth. Approx 42" wide ( all measurements include the overhanging cornice)x 80 and 3/4" high x 22 and 1/2" depth. Good colour and finish (shadowing across drawer in photo not change in clolour). Generally in excellent condition for its age. English Victorian pine wardrobe/ press. Rounded corners to plinth/cornice and edges as is typical for this period and model. Approx 73 and 1/2"wide x 82" high x 23" depth. Generally a lovely even colour - not the best of photos at this angle. Handsome good quality wardrobe of a type hard to find now. Small antique wardrobes that have good internal depth and also come apart to move/ get up awkward stairs are hard to find. 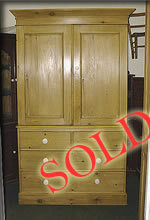 This antique pine wardrobe comes apart into many pieces, almost "flatpack". Continental, early last century. Approx 43"W(110cm) x 78 and 1/4"H (199cm) x 22 and 3/4"D(58cm) including overhanging cornice. All hanging inside with one drawer under. Quite a strong woodgrain and not a really pale yellow pine but not very dark. Floral design carvings and panelled sides. 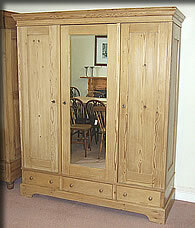 Large impressive antique pine wardrobe that dismantles easily to move or get upstairs. The centre section extends a little in front of the other two sections, called a "breakfront" style. 77"W x almost 81"H x 26 and 1/2" / 28"D all including overhanging cornice. There is decorative beading around the door panels and under the cornice. 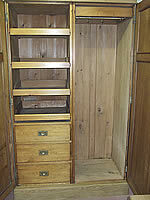 Victorian pine press with original shelves. In very good condition. 84"H x 51 and 3/4"W x 21 and 1/2"D.
Victorian two-door wardrobe with original fittings of rail, slides, drawer and hat/shoe box. 80 and 1/2"H x 23 and 3/4"D x 50"W.